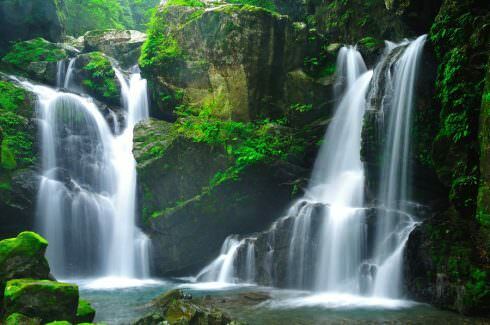 Shikoku 's largest waterfall , located in the upper reaches of the Kaifu River , Todoroki falls is also one of Japan 's top 100 waterfalls . Together with the many other waterfalls in the area they are jointly referred to as the 99 Todoroki falls , and a leisurely 2 - hour return walk up a 1.500m meandering path leads to Nabewan Falls , the highest of all the waterfall in the area . Take a town bus (Oobi Line) at JR Awa Kainan Sta. (approx. 1 hr). Get off at the bus stop "Todorokijinjya".